The 2014 6m Fall VHF Sprint actually occurs in mid-August in order to maximize the possibility of sporadic E (Es) propagation. This year the 6m sprint was a week after the ARRL August UHF contest, and that was an excellent roving adventure for me. But one thing I verified during that contest is that my rover vehicle needed a new radiator. It engine temperature got hot climbing hills, and I was required to keep the cab heat on high for extended altitude gain. A radiator was on order as I planned for the 6m sprint. A few days before the sprint, the weather forecast showed clear skies for Western Washington. So, I decided to try something ambitious and different, and easier on the vehicle: I wanted to attempt to activate seven grids in a single 4-hour sprint. Doing so would require the use of an airplane, and careful timing. It has been a couple of years since I’ve activated grids out of my airplane for a contest. I’ve frequently made plans to do so over the past two years, only to have the weather shut me out. But it looked promising for the 6m sprint. The idea was to start the contest near the CN76/CN77 border at the Ocean Shores Airport. Ocean Shores is a sliver of land with the Pacific Ocean on its western shore and Grays Harbor on its eastern shore. The weather is frequently foggy in the summer even as the rest of the region is bathing in sunshine. The last time I was actually able to participate in a contest by flying to Ocean Shores was during the 2012 CQ WW VHF contest—only after an epic battle with weather. 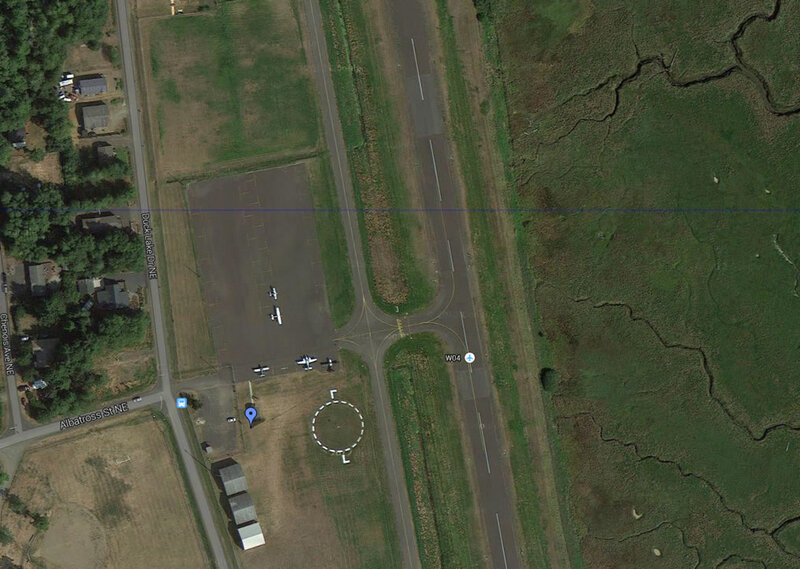 What makes Ocean Shores attractive for a rover is that the airport parking ramp has a line of latitude going through it that splits CN76 to the south and CN77 to the north. And as it happens, CN77 is in the top 10 list of rare Maidenhead grids. In fact, it is this very fact that first got me thinking about doing VHF contests as a rover. The other convenient thing about Ocean Shores is that ten miles to the east is the Hoquiam airport in CN86. So that makes three grids that can be activated by airplane very quickly. I would then fly back to my home airport in Snohomish, Washington, that is located in CN87 near the CN87/CN88/CN97/CN98 grid intersection. Of course, I would work stations while in motion (on the ground). The planned route for activating CN87, CN88, CN97 and CN98 out of the truck. The airplane station was quite simple: a Yaesu FT-857D (100 watts) and a car battery and power booster for power. The antenna was a 3-element WA5VJB-style “cheap” yagi that I designed specifically for the airplane rover. It was held on a 20′ fiberglass mast. A Winkeyer was used for keying and macros. The 2013 Fall VHF 6m Sprint rover. For 2014, the rear antennas were not used, and the front mast was extended to 12′ while in motion. Additionally, a Yaesu FT-857D was monitoring 52.525 FM, with a 6m vertical antenna. As it happened, this yielded no QSO. But I once made a 6m FM QSO during a sprint, so it was worth a shot. I got an early start by leaving home at 12:30pm on Saturday, fueling on the way to the airport. The first order of business was cleaning the bird droppings off the plane. I hadn’t flow in a few months, and the birds seem to enjoy using the plane for bombing practice. As I was loading gear into the plane, I realized something horrible: I had forgotten the “thrust bearing” that is critical for holding the mast vertically. I scrounged around in my hangar locker and the pick-up truck tool box and came up with a makeshift alternative using a couple of “topper” clamps and a couple of C-clamps. One c-clamp served as the “bearing”. The “topper” clamps fastened to a hard point on the airframe that the c-clamp clamped to. It ended up working really well, and has me thinking about building an even better system around “topper” clamps. The next problem was even worse: the airplane battery was too discharged to start the plane. It took some time, but I rigged up a way to jump the plane from the car battery I was carrying in the plane. (You cannot easily jump-start a plane because there is a lethal prop spinning a few feet from the battery, and prevents one from safely replacing the engine cowling.) The plane finally started, and was taxied over to the fuel pumps–a two minute journey. You can guess what happened next. After fueling the plane, the battery was unable to turn the engine fast enough to start it. I pulled the plane back to my hangar and went through the steps of “hot wiring” it again. With the help of my hangar neighbor, I was able to jump start the plane in a way that left it ready for flight. It all took a lot of time, though. The flight to Ocean Shores was pleasant and uneventful, but I was going to be late getting started. An automated weather reporting system in Hoquiam informed me that the winds were stronger and gustier than had been forecast. The landing at Ocean Shores was a little more exciting than usual, but the strong winds slowed the plane down quickly and I made the first exit right into the ramp. I taxied over to CN77 at the northeast corner. Even though it is slightly up-hill to CN76, the wind would make it easier to tug the plane from CN77 to CN76 than vice versa. The antenna and mast were deployed and ready to go by 4:30pm…thirty minutes into the sprint. The practical implication was that I would have to skip Hoquiam (CN86) and only activate 6 grids, but I would be able to spend a few more minutes in the two Ocean Shores grids. I made a quick run of the big Puget Sound stations in CN87 and Mark, KB7N, in CN97. Then I heard John, VE7DAY, calling CQ from CO70, so I swung the beam north to call him. Alas, he never was able to hear me. But Johnny, KE7V, in Port Angeles (CN88), did hear me and we made an easy QSO. What is amazing about this QSO is that there is 50 miles of the tallest parts of the Olympic Mountain range directly between us. I also worked WA7ZWG in Bellingham, Washington (CN88), also on the other side of the Olympics. The winds were trying their damnedest to take down the mast and antenna. I mostly operated with one hand on the mast…just in case the improvised “thrust bearing” detached from the plane. Activating CN77. Notice the effect of wind on the fiberglass mast. After 15 minutes (and 7 QSOs), I jumped out of the plane pulled it to the south end of the airplane parking ramp, in CN76. I worked most of the same stations again, including KE7V. I turned the beam to the south in hopes of working CN86, CN85 or CN84. With a spin of the dial, I found N6RO calling CQ from CM97, near the Bay Area. The QSO surprised us both. Next was KF7DSM in DM26. We had ourselves a genuine (if small) Es opening! But I didn’t hear anyone else. Instead, I told N6RO to standby a minute because I would be in a new grid. I jumped out of the plane with a towbar and pushed the plane against the wind (but slightly downhill) back into the NE corner of the ramp, and worked N6RO and two stations in DM26. By now it was approaching the scheduled departure time from Hoquiam. I had little room to spare at the other end of the rove, so I packed up and departed. As I climbed out from Ocean Shores, I could see fog rolling in around Copalis, WA to the north and Willapa Bay to the south. I suspect Ocean Shores would be fogged in within the hour. The return flight was enjoyable and reasonably quick. During it, I organized a small collection of things that had to move from the plane to the truck. I hit the road at 6:45 pm (local), a few minutes behind schedule and immediately worked Pete, N6ZE/R on Whidbey Island. In my haste, however, I loaded up the wrong itinerary in the GPS. It was trying to take me to Mt. Pilchuck—an hour away—instead of to a nearby stop in Lake Stevens, some ten minutes away. By the time I got to the stop, it was time to go, so I primarily worked people while in motion from CN87. Price road was the next stop. This road travels through CN87, CN88, CN98 and back into CN88. I was able to work KA7RAA/R (while he was in CN88) consecutively in all three grids as I made these transitions. Except for one spot in CN88 at the end of the public road, there is really no place to pull over on Price Road. I spent the next 15 minutes driving back and forth between that pull-over in CN88 and a turn-around spot about 1/4 mile down the road in CN98. Fortunately, the traffic was light. Each trip yielded a couple of new QSOs. With 30 minutes remaining in the contest, I headed back into CN87 for a 10 minute trip to CN97. This spot was on an isolated 500′ hill with expensive homes, but there was one small commercial building that I felt I could park in front of. Even before arriving, I stopped to work a couple of stations, and within a few seconds, a “local” pulled up on a riding mower to ask what was going on. He was friendly, though, and strongly recommended I drive 1/4 mile to the next hill that was even higher. I did. Now, at my last stop and with 15 minutes remaining, I jumped out of the truck and extended the mast to about 20 feet. That made a noticeable difference. The result is a final score of 1,232. Several stations that worked me in all six grids: Paul, K7CW, and his brother Johnnie, KE7V, Eric, N7EPD, and Sam, WC7Q. Mark, KB7N, worked me in all but CN76, and was the only CN97 station I heard. The presence of two other rovers made the sprint even more enjoyable. Pete, N6ZE/R, and I worked five time, and KA7RRA/R and I worked four times. My thanks to everyone who made this a most memorable sprint.